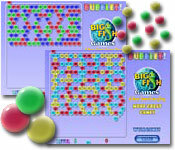 Play Bursting Bubbles for delightful puzzle game entertainment and fun. 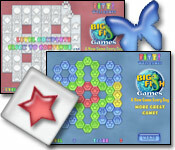 There are two very different modes of play, Frantic and Puzzle Mode. Puzzle Mode is more of a relaxing adventure in bubble popping. Here it is strategy and skill that will prevail instead of nerves and quick reactions like in Frantic Mode. Rearrange bubbles and pop them off the screen. Each pop drives the bubble meter lower, but watch out, waste your popping on small groups and suddenly your surrounded by unmovable and unpopable (is that a word?) shiny black bubbles that will leave you racking your brain in an effort to manipulate them away from your precious bubbles. 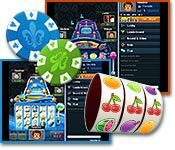 Great entertainment for the whole family and maddeningly addictive! To move a bubble just left click on the bubble and left click again where you want to move it. A faster way to move them is to hold the left mouse button down and nudge the mouse in the direction you want to move the bubble. WHY WON'T A BUBBLE STAY MOVED? For the bubble to stay moved, one of the two bubbles moving must touch a group of at least two other bubbles of the same color, thus forming a group of 3 or more like-colored bubbles. If they do not, they will move back to their original locations. To burst the bubbles, right click or double left click on one of the bubbles in the group you want to burst. You need a grouping of 3 or more bubbles to make them pop. Pop enough bubbles to reduce the bubblemeter to zero and move on to the next level. If the bubblemeter boils to the top, the game is over. The larger the group of bubbles you pop at once, the (exponentially) more points you get for popping them and the more the bubble meter moves. As an example, popping a single set of six bubbles is worth twice as much as two sets of three bubbles. You also get more points the higher the level. In frantic mode, the bubblemeter increases as time goes by. In puzzle mode you get more obstacles, but no time limit. Popping a group of only 3 bubbles will not move the meter much in puzzle mode. You start with three panic button credits. Each completed bonus level gives you 1 to 3 new ones, the higher the level the greater the number. Clicking on the panic button eliminates 13 black bubbles, however in puzzle mode it only eliminates black bubbles if you are stuck, otherwise it will do a move for you.